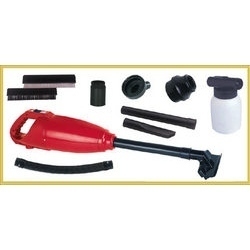 Leveraging on our rigorous research and development work, we are able to manufacture highly efficient handy vacuum cleaners. Our handy vacuum cleaners are easy to operate, compact in design and light in weight. Incorporated with a specially strong suction, these vacuum cleaners ensures high vacuum performance. We developed our range in variety of models to fulfill domestic requirements for cleaning upholstery, carpets, floor & furnishings etc. Voltage 230 , AC, 50 HZ. To clean Carpet, Sofa, Cub Board, computer. To clean kitchen, & spider Webs from Ceiling. High speed motor rotates the poy carbonate impeller to create the vacuum hence suction. An ISO 9001 2008 certified company, Moniba Anand Electricals Pvt. Ltd. was successfully established in 1979 manufacturing domestic and industrial water purifiers. In 1993 our industrial pumps division was started along with trading of air operated double diaphragm pumps. Currently we manufacture a wide range of pumps including Air Operated Double Diaphragm pumps, Peristaltic hose pumps, metallic and non-metallic centrifugal pumps, portable submersible pumps etc. Our dedicated staff and employees have helped us become one of India.s leading manufacturers and suppliers of industrial pumps.